Already have ideas for your small bathroom makeover? We have some, but wait, before we start, make sure you understand some important points. First, you must figure out what should be makeover. Whether, it is just a bathroom cabinet, style, floor, or all of them. Do not throw away the items that can still be used. Second, think about the budget. If the paint of your bathroom cabinet was worn, go to home decor stores. They will help you to make them look new. It could save the budget. Third, think about the material. Choose the materials accordance with your budget. But remember, find the right one that has a long life, resistant to mold and mildew resistant. Fourth, do not make a small room to reduce the creativity you have. Creativity is infinite space. If you need a new idea for your small bathroom makeover, you should throw away everything, sometimes an extreme measure needed to get fresh and new look. Fifth, After all, this is your bathroom. At least you need bring what you like. But remember, you have limited your options. This is to anticipate convenience. Six, do not let your small bathroom decrease the creativity. The last, If you have doubts in deciding "what to do", try to consult with the designer. This may add to the cost that you spend, but they will help you get the right idea for your small bathroom makeover. Okay, now, let’s get some makeover ideas for your small bathroom. How about shower-spa of makeover ideas? Did not need broad space, it needed some clever tricks. For example, like in the picture, making room shower combined with smart drawer that is installed on its boundary. Save space and cost, you no longer need a shower cabinet for necessities. On the outer side shower, you can install a sink or bench, just like in the spa. If your bathroom is really small, let's throw the barrier. In small room, the barriers just make room look tighter. It does not matter if you did not use them. For more attractive display, you can decorate the wall on shower side by installing different motive with the other side. As a complement, use the same motif on the floor like shower wall’s. 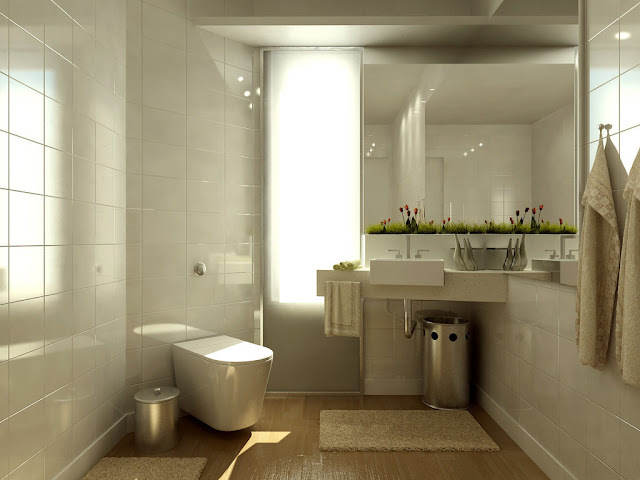 You know, combination between black and white can make your bathroom more attractive? This small bathroom makeover is the right choice for you who are easily bored with something. Black and white can be easier for you to set up the room. If you did not really need a shower, let’s change it with bath up. But, if you put the bath up, you have to throw the cabinet, to make the room look wider. For an extra accent, you can use bold colors in accessories whether it is the mirror or for the vase.